If you read my post “Anne Boleyn and the Tower of London”, you will know that the Royal Palace where Anne stayed before her coromation and where she was tried and imprisoned no longer exists as it was demolished in the 18th century. The White Tower is the black squarish blob in the middle and below that you can see an x below it which marks the site of the Great Hall and if you follow that around to the right you can see 2 which marks the Palace Building and then a 4 which marks the Queen’s Lodgings. 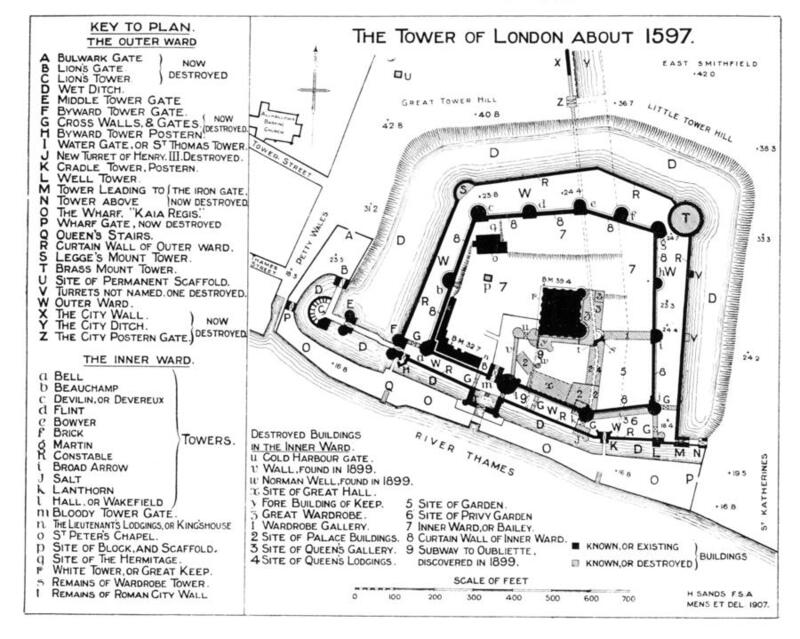 If you then compare these plans with the present day Tower plan found at http://www.hrp.org.uk/Resources/Tower%20of%20London.pdf, you can see that the Queen’s Lodgings would have stood on the present day lawned area between the White Tower (38) and Lanthorn Tower (20). Weir also writes that Anne’s scaffold was “erected on the present parade ground north of the White Tower” and if you look on the map of the Tower of London this is the area between the White Tower (43) and the Waterloo Barracks (40). For information and discussion on Anne’s resting place, see my post Anne Boleyn and the Tower of London (at the bottom). This was extremely interesting and to see the palace portion of the Tower really helps the mind to better create a visual. So if Anne was here, no wonder she could not see her brother being executed on Tower Hill. She was in the SE corner and Tower Hill would have been up off of the NW corner. So if Lady Jane Grey was also here..? ?, she would not have seen Lord Guildford being brought back to St. Peter Ad Vincula….?? Once again Claire you supplied the answer and I enjoyed it very much. Now when I go to London this May I will stand on the wall closest to the river and let my mind do the rest of the work…..also I will go to the REAL spot where Anne was executed. It might be helpful if you modified this image to state that “p” is the site of the current memorial, and insert a further annotation, north of the tower, showing a more correct (even if still approximate) scaffold site. The “p” is west of the White Tower, whereas you specifically state that the scaffold site was north of it. Otherwise, thanks for you lovely website. I don’t really want to mess with a plan that’s not my own. You’re right with regards to the first 1597 plan with the compass bearings on it, “p” is to the west of the White Tower, but then Alison Weir is talking about where she believes Anne Boleyn’s scaffold to be. In Tudor times, Tower Green stretched all the way from where you see “p” to the north of the White Tower where contemporary reports say that Anne’s scaffold was built. On that plan, you’d be looking just north of where it says something like “BM 39 4” for the true scaffold site used for Anne’s execution. 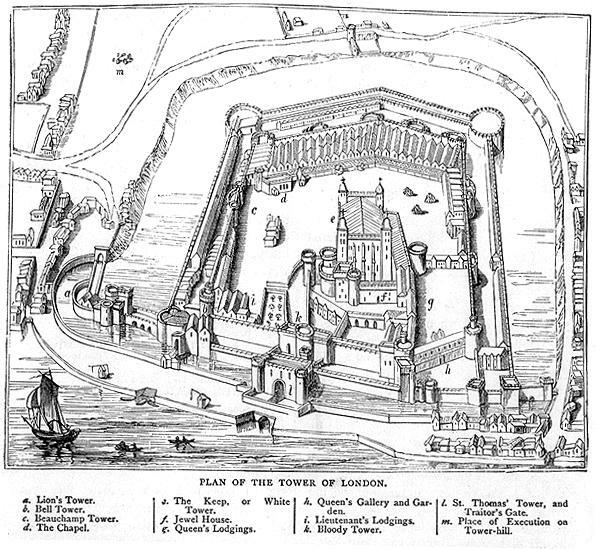 For ease and for the use of today’s vistors to the Tower, I mention that the site can be found between 40 and 43 on the modern plan of the Tower of London, which is right by the entrance to the Crown Jewels. Today it’s a parade ground. I’m trying to figure out the journey Anne would have made from her barge to get the the cold harbour gate. I’ve been watching videos are studying the map for hours. I guess map reading just isn’t in my list of skills. I can see the Court gate where she would have gotten off and been greated by William Kingston. Thats the capital H in the first map. Then I’ve read that she was taken along the back of the leutenants lodgins with is the lower case n in the first map and along the Outer wall until she gets to the cold harbour gate which is letter u. Its here I’m a little lost, which is “the back” and how do they get to u. Is there are gate entrance or am i seeing obstacles that aren’t really there. Sorry if I’m being picky. I was one of those annoying maths kids that would say “but why” all the time otherwise they wouldn’t understand the method lol.